In the last two years, social media has shaken up the sport of football and turned teams into digital marketing machines. Mashable.com reported on how the NFL is winning fans and increasing engagement by running with social media marketing. From Facebook to Twitter and numerous other social channels, NFL teams have become deeply entrenched in the many aspects of social media. They realize that these platforms offer unlimited promotional and branding possibilities, as well as real-time access to an ever-growing fan following. Twitter has become a football favorite this season, with the majority of players having accounts for personal branding. More players have taken to Twitter because team attitudes toward the social service have changed. While players had previously been discouraged from using Twitter because of the fear of disclosing too much private information, now teams are encouraging them to generate a following, but to avoid sharing anything too personal or confidential. Teams are also using Twitter to control their images. When a team story or mention appears on Twitter, teams are able to address it quickly and directly based on the real-time nature of the social service. Social media marketing is also being considered a primary driver of fan engagement because of the incredible access it provides to players, teams, game-day commentaries and all kinds of football-focused media. Players now have the ability to communicate with their fans, teammates, and other players in the league. Social media gives them a voice and lets them share their personal stories, which strengthens their fan followings. Sports media journalists are also reaping the rewards of social media. They can now provide real-time commentary to fans and players, as well encourage fan discussions on game-day events and share important promotional information. Looking forward, social media usage is expected to rapidly rise as fans, teams, and players realize that these social opportunities offer enormous benefits. Fans gain greater access to players and team information. Teams can increase their promotional potential and fan following, and players have the chance to communicate with everyone and be more than a number in a jersey. 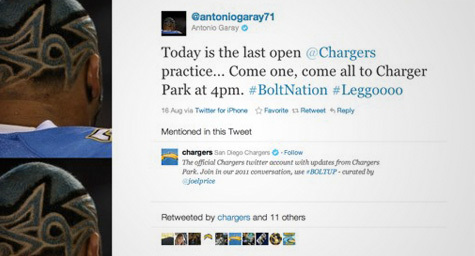 When it comes to the NFL, social media is a win-win for everyone. 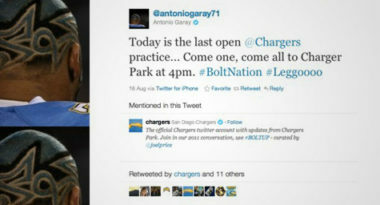 Read more about social media marketing and the NFL at mashable.com. Check out MDG’s infographic: The ROI of Social Media.